If you are ever looking for a perfect place to enjoy a break after a long day? Walk into Café Rodrigues. The relaxing music, friendly staff, and overall decor give off a quiet, chill vibe that can calm people and encourage them to embrace the moment. Whether you enjoy a hot cup of coffee or a cold fruit smoothing. Rodrigues offers a wide selection of beverages from smoothies and juices to coffee and liquor; it’s hard to decide what will hit the spot. With smoothies alone, it’s hard to decide on just one. Also, Café Rodrigues offers a wide selection of “super-foods,” aligning with healthy food trends. The salad choices are fresh and made on location daily. I recommend the tokia salad, which is edamame, rice, and crunchy rice noodles. The combinations of salads, drinks and other healthy treats are unique and delicious. Unlike anything, I’ve ever tasted before. As a picky eater, Café Rodrigues has plenty of options, that even I would try. 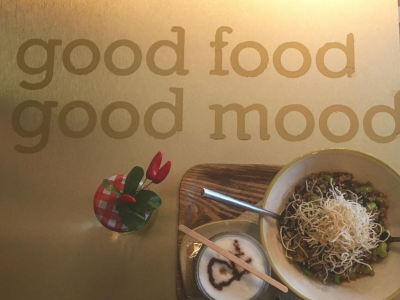 I motto I live by is good food = good mood. Café Rodrigues, proves this motto to be true. This café is great for everyone. If you have diet restrictions, are interested in pursuing a healthy lifestyle, or enjoy delicious, organic and local food, hit up Café Rodrigues.